The Cromer Road interchange on the Norwich Northern Distributor Road (NNDR) project involved the construction of a new overbridge to take the re-aligned A140 Cromer Road over the NNDR. The A140 is one the primary traffic routes into Norwich city centre. The design of the new bridge placed it very close to the edge of the existing Cromer Road and as such it would need to be constructed whilst traffic was still using the existing road. Initial construction planning highlighted that extensive temporary works would be required to construct the bridge. Feedback from the supply chain indicated that these temporary works would cost approximately £500k. In order to mitigate the potential cost and time impacts on the project, we proposed that the design alignment of the new Cromer Road could be amended to move the new bridge further away from the existing road. 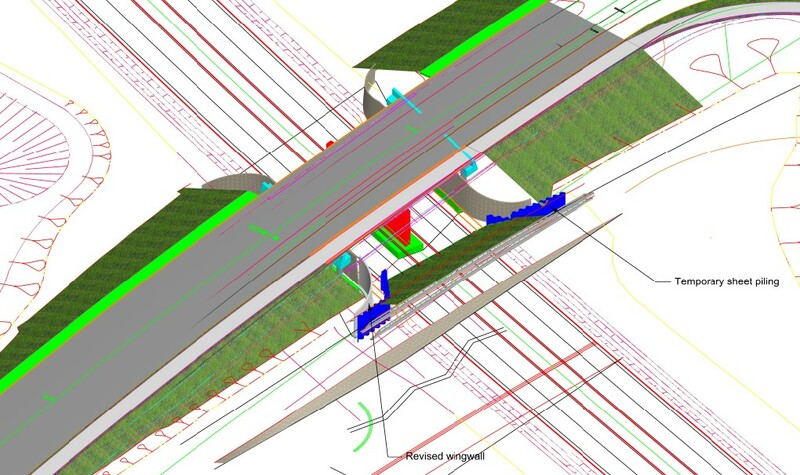 We produced an integrated 3D model for the proposed road re-alignment and bridge repositioning. This model included all relevant temporary and permanent works items, including highway alignment, utility diversions and earthworks slopes. The model demonstrated that the road could be realigned within the applicable highway design standards, without necessitating a formal change to the scheme DCO. As a result of the bridge being repositioned, the scope of the temporary works was significantly reduced, as shown in the screenshot from the model below. The price of the revised sheet piles amounted to £110k and programme savings in the region of 4 weeks were also achieved from the reduced temporary works scope.